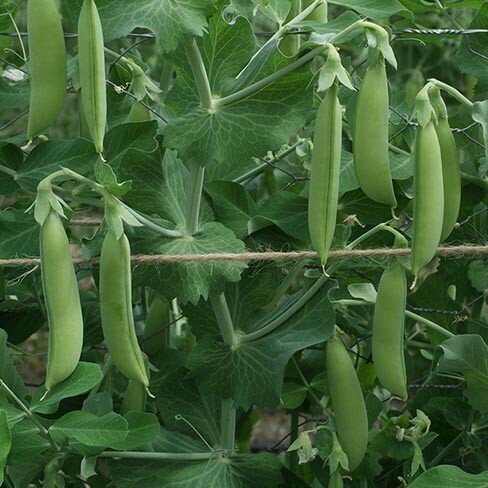 Snow pea Sugar Snap Nairobi is an organically grown, tender and deliciously flavoured snow pea variety. It's a pretty early variety that you can harvest approximately 55 - 60 days after transplanting. This variety produces beautiful and thick pods which are about 8 ½ cm long and 1½ cm wide. If you harvest the great tasting pods when they've said length and thickness, they are almost entirely stringless. The pods are darkgreen in colour. Pick the pods often to boost the production. You can grow this variety, in our Dutch climat, on wires or lying on the ground. Snow pea Sugar Snap Nairobi can be cooked, grilled, stir-fried, boiled, roasted, stewed, very shortly cooked used in salads and finally and finally steamed. Snow pea Sugar Snap Nairobi is delicious in combination with arugula, tomatoes, goat cheese, noodles, rice, beef, chicken, carrots, french beans and broccoli. Use them also in cold salads, Asian and African recipes and add them to soups, stews, casseroles and salads. Non hardy annual. Height: 60 - 80 cm. Pre soak the seeds for 24 hours in tepid water before sowing. The seeds soak up all the water and this helps with a quicker germination. The seeds can also be pregerminated. Put the seeds in a little container filled halfway with water. Fill the container regurlary half way because the seeds soak up a lot of the water. After 3 of 4 days the seeds should have a little root of about 1 cm in size. Sow indoors or outdoors from half January on for an early harvest. Pre soak the seeds. Sow in separate pots or seeding trays filled with moist potting soil. Sow 1 seed per pot. Harden the seedlings of from half May by putting them outdoors during the day. Put them on a sunny plot after about 4 - 6 days. Give the plants a sturdy support. Keep moist and weedfree. Sow outdoors from half March on. Sow the seeds deep enough to make sure that mice or birds don't eat your seeds. Sow in rows. Keep the rows about 40 - 50 cm apart for low growing varieties. Keep the rows about 100 - 110 cm apart for high varieties. Don't plant or sow beans on a plot where other bean varieties have grown in previous years. Earth the seedlings up, when they're about 10-15 cm tall. Provide the seedlings with enough support.